Danielle W. with Frisian Isaac: "I immediately felt at home in the saddle ..."
"I have always been fascinated by the slightly different saddle form. Would have liked a long time had. But did not trust me and did not want a saddle of unknown origin. For me, it was always important that a good saddle with the horse grows and can also easily "readjust". The Ibero Amazona Comfort I saw the first time in Natura three years ago. 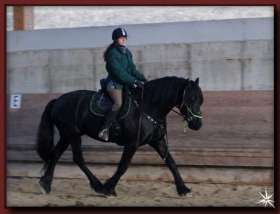 I am riding on my great Frisian horse, since Isaac had not yet ridden on horseback. I felt immediately in the saddle "at home" and after a very short time was a fire and a flame. So my boy got a saddle that was more than a year ago. Meanwhile, Isaac has ridden on and he runs very nicely, since he also feels comfortable. The saddle is super beautifully processed, looks great on the Frisian, is absolutely comfortable and gives me security. Now we are at the superior, if the big one also receives an Ibero Amazona Comfort. We are absolutely convinced fans of your saddles."